The new Charger II has finally arrived and we are blowing out our remaining stock of the 2012 Charger. Now prices listed are an additional 20% off of remaining stock while supplies last. The Charger’s 3D profile delivers smooth power throughout the wind window, excellent for free style riding and big air. The Charger offers great pop and low-end power making it perfect for nailing all the new freestyle tricks. At the same time, the Charger from Peter Lynn is fast and powerful enough to put a grin on the face of even the most demanding wave rider. The Charger’s exclusivity is a result of years of experience in Twinskin design. It represents yet another leap forward in terms of performance and safety. Features such as optimized panel and profile design and the new VPC3 system, combined with a redesigned tip shape that significantly increased performance and turning speed. With all this added performance, the Charger still holds the Twinskin stability and Auto-zenith feature, which remains unmatched by any other kite design out there! The Charger has an amazing wind range. Its good low-end performance, combined with the quick and easy turning, allows you to ride a smaller kite than you would have previously chosen in any given wind speed, without compromising the top end that the Twinskin kites are known for. The Charger’s wind range will give you the confidence to ride in any condition, no matter how gusty the wind is. The Charger turns surprisingly quick and flies smoothly. This kite challenges you to do kite-loops and go big. 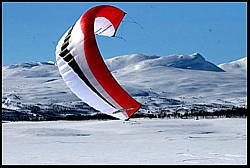 It can either be flown with slack or tight rear lines, its flying and turning speed are not affected by the rear line tension; this makes it a suitable kite for various riding styles and for riders of all types of skill levels. One of the best things about kiting is going big! 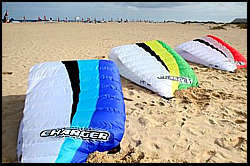 The profile shape of the Charger, in combination with the speed of the kite gives mind boggling lift for extremely high jumps. The large amount of float stands for longer airtime to perform supreme tricks and steady landings. The Charger has a lot of Pop and great speed. You can load up the kite and get an explosive pop from the kite. This makes new school tricks with the Charger a piece of cake. As with all Twinskins, the Charger has an incredible stability. When parking the kite above your head, it does not luff or collapse. The Auto-zenith feature helps you by bringing back the kite automatically to the zenith. When practising new tricks or getting washed by a wave simply let go of the bar and your kite will be waiting for you at the zenith. This awesome feature has never been matched by any other kite manufacturer! Just one more thing that makes the Peter Lynn Twinskin Design one of the most repsected water foil designs on the market. 8, 10, 12, 15 and 19 meters.